My family lives by one very simple motto when it comes to food around the holidays: It’s better to have too much than not enough. So it may come as no surprise that cooking for 8 people this Thanksgiving is more like cooking for 28. And in the off chance the 8 of us don’t actually eat the 7.4 pounds of turkey, two servings of stuffing, 3 scoops of mashed potatoes and gallon of gravy that we’re alloted, we’ll have ample use for what remains thanks to this Leftover Turkey Pot Pie with Cheddar Biscuit Crust. Round One of turkey may still be 24 hours away, but chances are you’ll be staring down a pile-o-leftovers come November 23. 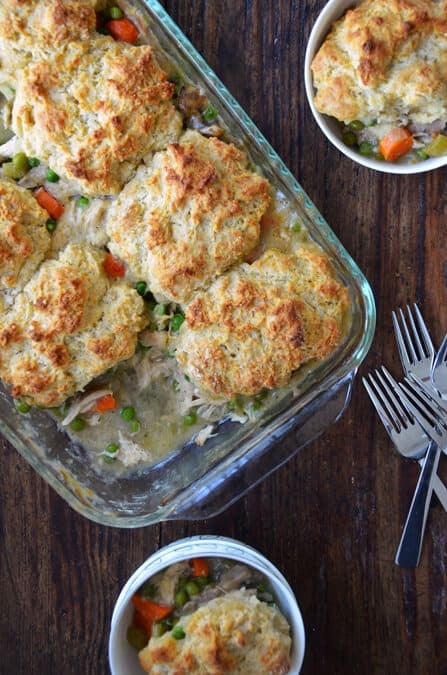 All that’s left to do is raid the pantry and fridge for your cheddar biscuit essentials and you’ve transformed yesterday’s bird into today’s crowd-pleasing casserole. Best of all, this recipe does double poultry duty and will make a mean chicken pot pie during turkey-less times. 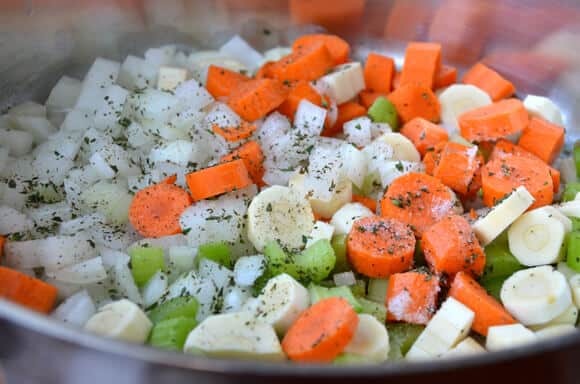 Combine the onion, carrots, celery, parsnip, thyme, butter, 1/2 teaspoon salt and 1/4 teaspoon pepper in a wide, shallow (3- to 4-quart) pot set over medium heat. 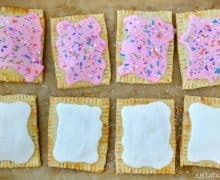 Stir until butter melts then cover and cook, stirring occasionally, until vegetables are almost tender, 10 to 12 minutes. Add the mushrooms and cook, uncovered, stirring, until tender, 5 to 7 minutes. Sprinkle the vegetables with the flour and cook, stirring constantly, for 2 minutes. Stir in the stock, scraping up any brown bits, and bring it to a boil, stirring, then simmer until slightly thickened, about 3 minutes. 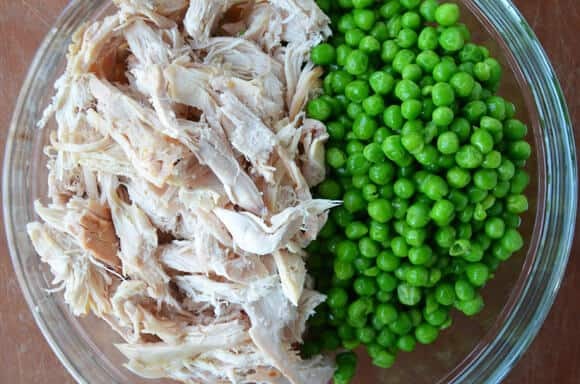 Stir in the turkey, peas, and additional salt and pepper to taste. Add the buttermilk and stir just until a dough forms. 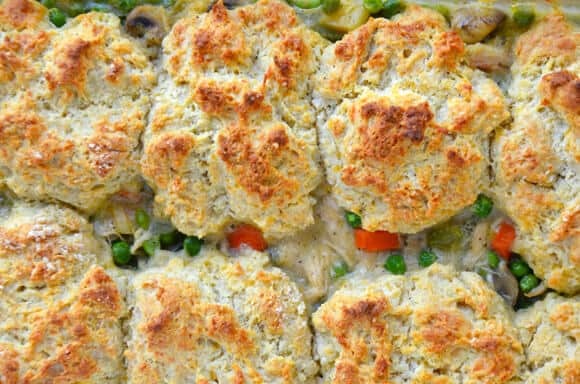 Drop the biscuit dough onto the pot pie filling in 8 large mounds, leaving spaces between biscuits. Bake until the biscuits are puffed and golden brown and the filling is bubbling, 35 to 40 minutes. Let stand 10 minutes before serving. 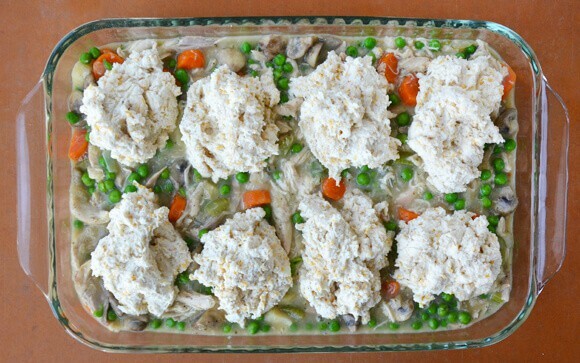 Place the baking dish on a sheet tray before baking in the event any filling spills over. 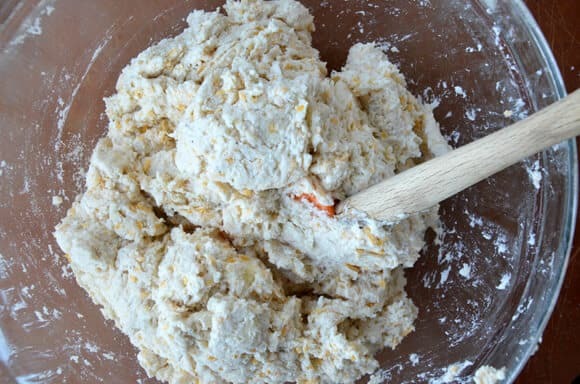 The filling and biscuit dough can be made one day in advance and stored separately. Reheat the filling over low heat just before topping with biscuit dough and baking. 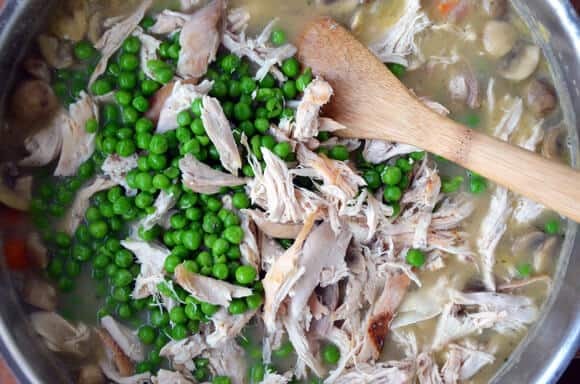 The fastest way to chicken pot pie is to make the most of a store-bought rotisserie chicken. Recipe loosely adapted from Gourmet.